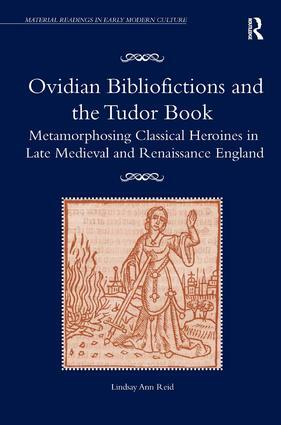 Ovidian Bibliofictions and the Tudor Book examines the historical and the fictionalized reception of Ovid’s poetry in the literature and books of Tudor England. It does so through the study of a particular set of Ovidian narratives-namely, those concerning the protean heroines of the Heroides and Metamorphoses. In the late medieval and Renaissance eras, Ovid’s poetry stimulated the vernacular imaginations of authors ranging from Geoffrey Chaucer and John Gower to Isabella Whitney, William Shakespeare, and Michael Drayton. Ovid’s English protégés replicated and expanded upon the Roman poet’s distinctive and frequently remarked ’bookishness’ in their own adaptations of his works. Focusing on the postclassical discourses that Ovid’s poetry stimulated, Ovidian Bibliofictions and the Tudor Book engages with vibrant current debates about the book as material object as it explores the Ovidian-inspired mythologies and bibliographical aetiologies that informed the sixteenth-century creation, reproduction, and representation of books. Further, author Lindsay Ann Reid’s discussions of Ovidianism provide alternative models for thinking about the dynamics of reception, adaptation, and imitatio. While there is a sizeable body of published work on Ovid and Chaucer as well as on the ubiquitous Ovidianism of the 1590s, there has been comparatively little scholarship on Ovid’s reception between these two eras. Ovidian Bibliofictions and the Tudor Book begins to fill this gap between the ages of Chaucer and Shakespeare by dedicating attention to the literature of the early Tudor era. In so doing, this book also contributes to current discussions surrounding medieval/Renaissance periodization. "[Reid] makes a refreshingly eclectic "sampling" of material from writers at the periphery to those at the centre of the canon, from ballads and broadsheets to Shakespearean drama …"
"This is a fascinating and thought-provoking book, which should be read by anyone interested in classical reception in this period." "Fascinating … an impressively wrought and thoroughly researched intricacy of texts, intertexts, literary transmission, and of the real and fictional figures adapting and moulding the reception of arguably the most popular classical writer from the late medieval era to the Tudor age." "The crux of Reid's thesis is an important idea: the representation of books in literature allows us to glimpse not only the cultural weight of specific texts, but also the "material identities of books and the historical conditions of the book trade"." "(…)This is an excellent book with some fascinating insights. It is very detailed in its literary references and covers a lot of material." - Natasha Amendola, Monash University in Parergon: Journal of the Australian and New Zealand Association for Medieval and Early Modern Studies, volume 33.1 (2016). Lindsay Ann Reid is Lecturer in English at the National University of Ireland, Galway.